The party were in Shadow Port -- the 13th Age's generic hive of scum and villainy -- searching for a box that they believed to contain some sort of focus for the geas that kept the Blue -- the sorcerous dragon overlord -- on the side of civilisation and decency. After battling some ruffians -- and seeing Jordan Young beheaded -- they had found the box but they had found it empty. They found this a bit puzzling. Ne-0n attempted to interface with the fabric of reality around him in order to glean some clues about the box but was soon assaulted by an overwhelming presence that threatened to drown his psyche. No closer to having an answer, the party decided to head back to the portal through which they'd been sent by the Blue; as they left the temple they spotted a gloopy shadowy thing following them at a short distance. This shady -- ho ho -- fellow seemed to be some sort of scout and didn't put up much resistance when the group assaulted it. Moving on, they got lost again and this time noticed that the streets were reshaping around them and seemed to be herding them towards the centre of the town; Amras floated up to the rooftops to get a better look and was attacked as more of the dark blobby things pulled themselves from the shadows. Inky black tentacle +10 vs PD - 18 negative energy damage. Natural roll is above target's Constitution: the target loses a recovery as they feel their life force draining away. The creatures proved to be a bit more effective in a group, until Amras dropped a fireball on them. One hundred points of damage will tend to discourage resistance from even the most tenacious of opponents. 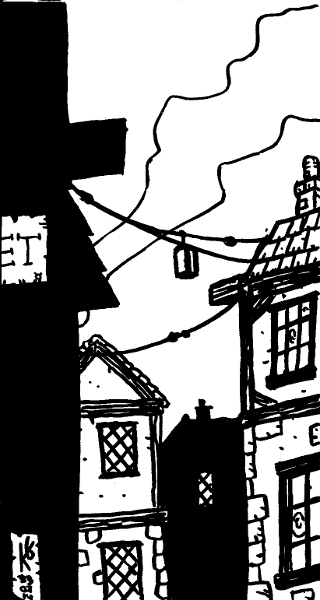 After the battle the party was beckoned into a house by a portly fellow; they were of course suspicious but the alternative was a series of running battles with energy-draining shadows through streets that were always changing. A spot of tea and cake with a rotund stranger seemed like the lesser evil. As the party ducked inside the man's cottage he introduced himself as Robul the Holy -- or Robul the Wet -- a priest of "the sea god"; Ne-0n spotted a small shrine in one corner of the living room devoted to a vaguely anthropoid deity with an octopus-like head and a mass of feelers for a face, and knew right away what kind of sea god Robul worshipped. This revelation didn't make anyone feel any safer. The interior of the house was covered in all sorts of charms and symbols; Robul explained that these were intended to keep him hidden from agents of the Prince of Shadows. As the priest shared his dinner with the party -- glancing at Amras' burning third eye with considerable suspicion -- he explained that he had been sent by the Priestess to keep an eye on Shadow Port but that he also had a personal goal; to reconsecrate the temple from which the party had fled. Robul told them that the town was alive -- 13th Age has living dungeons, so why not? -- and had taken a disliking to the party for some reason, and that while they would be safe under the protection of his charms, he wouldn't be able to help them escape. He did recognise the description of the albino man who Sartheen had seen carrying the pyramidic box; this was a wizard named Hallas, who was not associated with the Shadow Port thieves' guild but dwelled unmolested by both the guild and the living settlement in a ramshackle wooden tower towards the centre of the town. After a night's rest under the many watchful eyes of Cthulhu the party decided to further investigate the box. Sartheen thought the best way to test if it was indeed the object of their quest was to smash it -- if it was the focus of a geas, the dragonspawn surmised, it would resist destruction -- but Ne-0n argued that tampering with a geas would be dangerous and Amras made up some guff that demonstrated that he hadn't paid any attention during geas lessons at wizard school. The box was smashed to bits and nothing happened. Sartheen felt that the geas the Blue had placed on him was still active and so the party decided that they would visit the wizard Hallas, hoping he would know more, but were in no mood to venture out into the malevolent streets. Sartheen used his helm of communication to check in with Drakkenhall and request aid, asking first for a dragon -- a bold opening gambit -- but he was told by a black, assassiny-looking dragonspawn that there was a squad of assassins hiding out in the same cave that contained the portal through which the party travelled, and that they were ready to help. Having realised that they had murdered their own extraction team the day before, the party decided to sneak towards Hallas' tower to see if the town reacted against them. They left Jordan Young's body with Robul for a proper burial, but Sartheen kept some of Jordan's toes, according to the custom of his tribe; he planned to have them with a honey mustard sauce when the party stopped for lunch. Shadow Port seemed to unaware of their exit from Robul's safehouse -- or its attention was elsewhere -- so the party made good progress towards Halls' home, but were interrupted as a fiery mass fell screaming from the sky, shattering a nearby building. As they picked themselves up the party watched a figure stride from the smoking crater. It seemed to be a suit of black armour topped by a black skull wreathed in bright green flame; the blazing skull turned to Ne-0n and cackled. Amras tossed a spiky seed pellet he'd found in a previous adventure and thorny roots, er, rooted the skull-thing to the spot. It stopped cackling. The party then blasted the creature to bits. The armour survived the onslaught, a sure sign that it was enchanted; it seemed to be a good fit for Ne-0n but when it was identified as being made of halfling skin, the robot sorcerer declined the opportunity to wear it. He did keep the garment though, because player-characters never turn down loot, even on moral grounds. After the briefest of rests the party staggered at last to the base of Hallas' tower without any interference from the sentient settlement -- eat your heart out, Stan Lee! -- and rang the door bell. No answer came and so the player-characters spent a few minutes discussing whether to break in before realising that yes, they were player-characters in a Dungeons and Dragons variant so of course they were going to break into the wizard's tower. The building was of unusual construction, in that all the rooms were stuffed into the top two floors and the five storeys below that were empty save for a rickety wooden staircase looping around the inside walls. The stairs were trapped, of course, and the party suspected as much and so were careful about checking for traps as they went. Although Rarity spotted the traps, their magical nature meant that Sartheen could not disarm them and so instead I asked the players to roll a single d20 each as they stepped over the glyphs; on a one, they would slip and set off the trap. Stuart has appalling luck -- although I would challenge him in the next session -- and seems to roll at least three or four ones each session; these had been saved up for the stair climbing and so by the time the party reached the top, Sartheen the Red was more Sartheen the Crispy Fried. After passing through some living quarters the party reached the top floor of the tower and a wizard's study, complete with a wizard cooking up a fireball in each hand and demanding to know why they were in his house. This session happened two weeks ago but I didn't think enough happened to merit a discrete post, so I was going to combine it with the next summary; as it turns out my waffling got a bit out of hand and the combined post was far too long, so here's that session from two weeks ago anyway. Having stepped through the portal in Drakkenhall a somewhat dazed party appeared in a dark and damp cave. Behind them was a vast carving of a skull, its mouth wide open in a scream, or perhaps a Skeletor-like chortle; a few specks of magic sparkled in the mouth of the skull as the portal's energy dissipated. As the adventurers recovered from teleportation sickness they spotted a cloaked figure watching them from the opposite side of the cave. They pursued the figure and ran into his friends, a group of black dragonspawn, all of whom were slaughtered without mercy, for some reason. Emerging from the cave onto a wooded hill, the party looked down to see the lights of Shadow Port below. Sartheen the Red had been to the town many times before and it was on one of these occasions that the dragonspawn had seen an albino man with bright red hair carrying a pyramidic box to a temple; Sartheen's understanding was that the box contained the focus for the geas that bound the Blue -- one of the powerful dragon lords of the 13th Age -- to the service of the Empire. The group scrambled down the hillside, sneaked into town, and soon got lost. Sartheen remembered that Shadow Port had some sort of mystical protection against raids by hostile powers and assured his fellows that his inability to find the old temple building was a result of this power, and not his poor memory or even worse perception rolls. The group approached an old washer woman for directions and Jordan Young the bard-brawler-pirate offered her a gold piece for information. The woman explained that she had a husband to feed, so Jordan produced another coin. She also had children who were hungry, so Jordan flicked another gold piece her way, and another when she mentioned the starving dog she had taken in just the other day. Jordan started to get suspicious around the time the woman mentioned the peckish cousin of the dog's children, but in a rare moment of restraint for this group, they allowed the shrewd old woman to go on her way rather than eviscerate her and take back their money. Amras took over negotiations as they collared a filthy street urchin and offered him one coin to take them to the temple and another if he'd wait for them outside. This proved to be a more effective approach as the blatant Victorian stereotype led them to an empty and overgrown square at the centre of which was a murky pool and a grey stone building spotted with moss and grime. The great bronze doors of the building screeched like a krenshar in heat as they were pushed open -- stealth is not this party's strong point -- and inside the group encountered a trio of untrustworthy bandit types. It was no surprise that a fight broke out, but rather more surprising was Rarity -- the tiefling barbarian and the party's meat shield -- being blasted into unconsciousness by a wizard wearing those circular sunglasses that were all the rage in the 1990's, and most surprising of all was the beefy swordsman with whom Jordan was duelling rolling a triple critical, lopping off the bard's head, and sending it bouncing around the room. Jordan had acquired an enchanted orcish helm that gave him a sort of second wind when suffering a fatal wound but we all agreed that it wouldn't work if it was worn on a head that wasn't attached to a body. 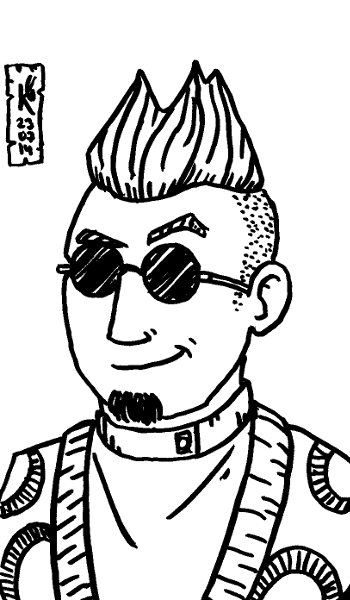 Mister Sunglasses rifled through Rarity's pockets and stole one of her magic items before vanishing with a smirk, while the rest of the party chopped his friends into bits. Victorious but battered, the adventurers mourned the passing of Jordan Young for about fifteen seconds before looting the temple. The upper floor of seemed to be some sort of store room for artefacts, and among the treasures Amras spotted a circlet emblazoned with the symbol of the Diabolist -- one of the bad guys and an Icon who had taken an interest in the elven mage in a previous adventure -- and so of course he picked it up and tried it on. The circlet vanished but the elf felt a boost to his magical abilities; also, a fiery third eye appeared in the centre of his forehead but he considered that to be a fair trade. Meanwhile the rest of the party -- sans Jordan -- pocketed a few bits of jewellery and after a while found the object of their quest, the strange -- and not at all like the Lament Configuration, no way Jose -- wooden box Sartheen had seen on his prior visit to Shadow Port. The box was locked but after a bit of trial-and-error and pass-the-parcel the mechanism was bested and the lid flipped open, releasing a puff of toxic green gas into Sartheen's face. As the dragonspawn coughed and spluttered the rest of the party peered into the box, only to find that it was empty. I wrote this review of Zak Smith's Vornheim back in April of 2011 and little has changed, except that I know Zak a little better than I did then, I've run a few games of some D&D variants since, and I have a new coffee table. I've changed the link to the Lamentations of the Flame Princess shop in the final paragraph as the original hardback is no longer available, although I am told a reprint is in the works. It's worth mentioning that in the three years since I wrote the original review I have done some minor work for LotFP, but at the time I was but a customer. Not that my association with the company would change my opinion of the book; I still think it's innovative and inspirational. Player: Fluffy the half-golem needs repairs! Where's the nearest alchemist? Player: I'll put the kettle on. A proper old-school GM cares not one jot for detailed maps of every street of every district of the City of Genericfantasyburg, because the old-school GM will just roll on a random table to discover what's round that corner or behind that door. I don't know him aside from his blog persona, but Zak S. -- it stands for Sabbath or Smith depending on which hat he's wearing that day -- seems to prefer this philosophy of generating random data and trying to sort it out at the table, but with Vornheim he suggests that even random tables aren't quite fun enough. Vornheim also represents an explicit dissatisfaction with the rpg book as a format, that as game books, they're perhaps a bit too bookish and aren't nearly gamey enough. Zak wants them to be more than just containers for text -- this is reflected, consciously or not, within the city itself, where snakes are the medium of choice -- and as such Vornheim is a thing to be used, a bundle of mechanics and tools, a -- you knew it was coming -- kit that only takes the shape of a book, for lack of a better format. Imagine I want to generate a city location, so in order to do so, I use the front cover of the book. I adore this. It's the author saying "I don't want the cover to just be the thing you stick the title and a pretty picture on, even if I am an artist; I want you to be able to get an actual use from the cover." The idea is to maximise game utility, because the prettiest painted cover image is of about as much use as a chocolate fire guard if your players want to know what's behind that green copper door. So, I want to generate the location. I get a d4 and I roll it -- this only works with the pointy types; my fancy twelve-siders just roll right off the book, off the table and into the dark corners of the room, where the spiders dwell -- onto the cover of the book itself. Vornheim is a city of towers, so let's generate one of those. 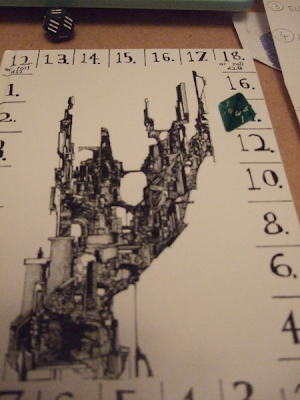 The 14 to the right of -- and almost obscured by -- the die tells us that the tower has fourteen storeys, and the 2 below the die tells us that the tower has two bridges linking it to other towers. The number rolled, a 1, tells us how many entrances the tower has. This takes about a minute, start to finish, more if you faff about trying to find your dice bag. It's not just cute and fun -- though it is that too -- as this kind of innovation is also there to make the generation of game data more useful and efficient; the exact same roll gives us a fighter with an Armour Class of 18 or 2 -- depending on D&D version -- of second level, and wielding a sword. The same chart can also generate an animal, monster, thief, wizard, group of city guards, inn, two types of internal room, two types of magical attack, and a poison. There's another very similar chart on the back cover, and the book contains a number of different pages that operate along similar lines. Not all the material in the book follows the same format. There's some prose description, maps, a couple of keyed map adventures, and more than a few random tables, but these are all infused with the same sense of trying to do more with such tools, to not fall back on what is expected of a city-based rpg sourcebook. This informs and supports the general approach of describing Vornheim through examples, rather than present an encyclopaedia of every street, house and citizen. That said, the GM is given the tools to generate such elements as and when they are needed, and more importantly perhaps, to make them interesting and dynamic when they do come up; Vornheim rejects the mundane, conventional and boring, and this attitude is apparent on every page. The stated goal of the book is not only to allow a GM to create a city on the fly, but to make it interesting, memorable and fun, and I would argue that it more than succeeds in that task. It is rather D&D-centric and I don't run D&D, but that's not the fault of the book and it's not as if Zak's blog title doesn't make it very clear what his game of choice is. It's not a huge problem by any means, as the book uses so few actual statistics and rules that it's easy enough to convert to one's chosen system, and besides, my key interest was in how Zak pushed the boundaries of rpg sourcebook presentation, and that's something one can appreciate irrespective of the game system. The book could have done with another editing pass perhaps, as there are some glitches here and there, such as missing table headers and a couple of cases of repeated and redundant information. In places, there's also some repeated and redundant information. Even so, these glitches are few and none of them have any negative effect on the utility of the book, and that's what counts at the end of the day. To compare Vornheim to the perennial Best City Book Ever nominee Ptolus is perhaps not fair -- although I sort of just do that, oops -- as they're very different products with very different intentions, and to say that one is better than the other seems a bit pointless. Let it be said then that I prefer Vornheim, even as an infrequent fantasy GM, because it strives to be more useful than exhaustive, and because I admire and support the genuine attempts to do something different within the format of the rpg sourcebook. 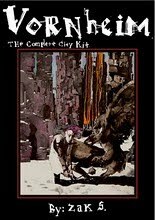 Vornheim is a sixty-four page A5ish pdf, more or less compatible with most versions of D&D -- even the Unmentionable -- and is available from the Lamentations of the Flame Princess shop for 19.25€. It's well worth every whatever-pennies-are-called-in-the-Euro-is-it-cents-I-don't-know. Last time the player-characters made a daring raid on the Archmage's floating prison Highrock in order to rescue the famed pirate captain Morgan -- oh dear -- who turned out to be a medusa. Still, a legendary sailor is a legendary sailor whether or not they have snakes for hair and can turn you to stone with a glance, so the team started planning their voyage into the uncharted east to search for Jordan Young's great treasure. Before they could set out there was the small matter of a brewing conflict between the Elf Queen and the Three, dragon overlords of ultimate evil. The party were asked to investigate an abandoned abbey thought to be a nesting site used by the dragons and destroy any eggs found there, in an attempt to dissuade the Three from further attacks against the elves. Amras the elf wizard, always more of a politician than a warrior, decided that instead they would capture the eggs and hold them as insurance, which seemed to everyone to be a much more sensible idea. Why were the dragons hiding out in an abbey? Well, because it tied into the players' relationship dice rolls from the previous session but as they made no attempt to research the place -- this lot would be terrible at Shadowrun -- and sneaked in by a secret entrance they didn't really engage with any of it. As an aside, there's an interesting tension here. The Icon relationship rolls are supposed to drive story and to tell the GM what sort of elements will come up in a session, but if the players wander off and don't interact with the rolls, is it better to let them miss out if that's their choice or have the rolls impact the game anyway? I'm inclined toward the former and that's how I played it -- so among other things they never met the travelling cleric who was looking for a saint's bones -- but the game itself seems to suggest that the Icon rolls are treated as a sort of Quantum Ogre, and so the cleric -- or someone else associated with the Priestess -- should have popped up anyway. This is part of the game that's worth further thought I, er, think. The abbey, its grounds, and the saint's remains were borrowed stolen from "A Box of Old Bones" from White Dwarf #71. I stuck it on the little island to the east of the Spider Wood on the 13th Age map as that seemed like a nice place close to both the Elf Queen's wood and the Three's headquarters in Drakkenhall, and it gave the player-characters an excuse to use their brand new sailing vessel. Along the way there was a brief argument between the party and their new captain over who was in charge of the ship and as a result they demoted Morgan to first mate. Attentive readers will remember that Morgan was the only one who could take them to the island on which the precious treasure was hidden, and was also a medusa, so that's not going to come back and bite them at all. They spotted an obscured cave at the base of the island and decided to investigate it as a potential entry point to the abbey. Leaving "first mate" Morgan in charge they rowed over to the island -- in broad daylight! -- and then chucked a couple of light spells into the cave, alerting the guards to their presence and setting off all the alarms. If you're thinking "well gosh, this doesn't seem to be a very stealthy approach" then you would be correct. I'm still not sure what the plan was but so be it; it allowed me to have some fun with kobolds. Kobolds in 13th Age are a great laugh. They're the same low-level humanoid sword fodder of other D&D variants but they also get a wonderful bonus ability; if a kobold rolls over an opponent's Wisdom score with an attack roll then they also activate a hidden trap -- generated on a random table -- that causes a little bit of extra damage and sometimes a minor negative effect. It's not much but it adds a little bit of fun unpredictability to the little dragon-dog things and guess which set of player-characters chose Wisdom as their dump stat? Yes, there is an element of the Quantum Qobold about all this as the traps don't exist until they're triggered but I was having too much time to care. The resulting battle in the caves beneath the abbey was one part Viet Cong and one part Road Runner and it was ace; I have now fallen in love with kobolds and my players fear them so all is well in the 13th Age. Moving on to the crypts beneath the abbey the player-characters ran into some black dragonspawn who mimicked Sartheen the Red's sneaky backstabbing abilities, and after killing them -- responding to the sound of something pounding on a door nearby -- set free one of the former abbots, who had turned into a ghoul at some point in the preceding decades. They found the bones of a saint and looted the tomb of a famous warrior -- both would have tied into relationship rolls if they had pursued the matter -- coming away with a pair of fancy duelling swords, a set of magic gloves and some magic oil. Even with all his knowledge of magic Amras couldn't discover any particular use for the oil but the party's enchanted items began to cry out to be slathered in the strange glowing liquid, a clamouring that continued until Jordan Young doused his bone blade in the oil, the sword letting out a contented sigh. A set of narrow spiral stairs led up to an impressive but ruined church and three blue dragons who looked on with much amusement as the player-characters placed all their attention on the ground and never once looked up until it was too late. Not that the element of surprise mattered much as this party seems to have quite the aptitude for killing dragons. After a bit more exploration and some more Tom and Jerry kobolds the player-characters found the central courtyard of the abbey and around thirty dragon eggs, there for the taking; Sartheen, Jordan, and Rarity stepped out into the open and with a loud "POP!" vanished into thin air, leaving the two spellcasters alone with an unknown number of kobolds, dragonkin, and dragons lurking nearby. Amras and Ne-0n then engaged in some Olympic level faffery as they tried everything they could think of to avoid leaving the relative safety of their building, thinking that the other three had been disintegrated. They did manage to confirm that the dragon eggs were in fact a powerful illusion but that didn't help them solve the more pressing problem of what to do next. Meanwhile the others had not been turned into a cloud of fizzy atoms but instead had been transported a hundred miles or so south to Drakkenhall where they found themselves in a large hall and face-to-face with an enormous blue dragon. This was of course the Blue herself, who explained that she had come to an agreement with the Elf Queen; if Sartheen was delivered to the Blue, then all hostilities between the two Icons would cease. This was because the Blue was very interested in studying Sartheen -- the only red dragonspawn in the entire world -- although Sartheen got the distinct impression that "studying" in this context meant "dissecting". The elf and the robot turned up at this point -- having summoned up the courage to step into the teleportation effect -- and Amras attempted to negotiate with the Icon, although his terms seemed to revolve around leaving the red dragonkin behind while the rest of the party returned to the abbey. With things getting desperate Sartheen's player traded in his relationship die with the Prince of Shadows to have Sartheen recall a time when he was in Shadow Port -- hive of scum and villainy, city of thieves, etcetera -- and saw an unusual pyramidic box that contained -- or so he was told -- the geas that bound the Blue to the Emperor's service and kept her off the path of evil. Sartheen could get this box for the Blue, he said, if she let them all go. The Blue accepted the terms and with the wave of one enormous clawed hand slapped a geas of her own on Sartheen, and with the wave of another opened another portal, this time to Shadow Port. Marvel UK's Transformers comic is known for -- among other things -- Simon Furman writing a toy advert like it was a proper story with proper characters, Geoff Senior's amazing art, and the introduction of Death's Head yes? Although it was called Transformers it was more or less an anthology title; the first third was a reprint of part of a US Transformers comic -- the British version came out each week so they had to split the stories to avoid catching up with the monthly US title -- the middle section was a home-grown story, and the last third was a reprint from elsewhere. In the early days of the comic the UK and US stories took turns in the first half and the reprint made up the second half but that's not relevant to my point, if indeed I have one. In that second-slash-third slot we'd see all sorts of stuff. The comic was sold as a tie-in to a line of science fiction robot toys so the reprint tended to tick at least one of those boxes and we'd get bumf like Inhumanoids and Robotix, but we'd also get Barry Windsor-Smith's beautiful Machine Man mini series and Hercules: Prince of Power in which Herc slept with alien women, rode horses through space and got Galactus so drunk he took off his helmet. For years I thought this was what Hercules was like all the time. 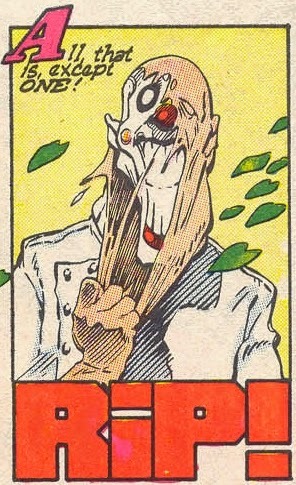 I think Strikeforce: Morituri was in there too but that may have been in Marvel UK's Thundercats comic. Either way it was a bit grim for kids, that one. 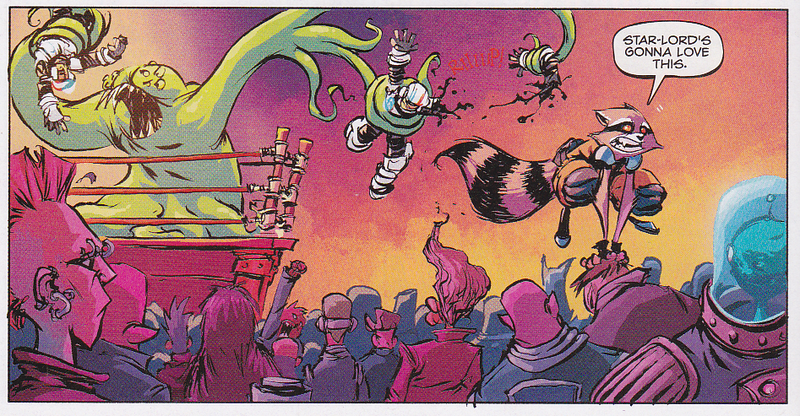 What was in there was Rocket Raccoon, a bizarre mix of Saturday morning cartoon, cosmic science fiction, and what can only be described as horror; this image stayed with me for years. What is Rocket standing on? No idea. 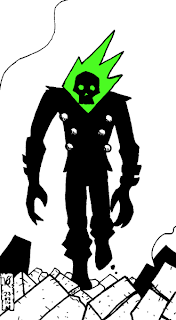 It's been a funny few years as this somewhat obscure character has risen in prominence, reappearing in comics decades after his first appearance, popping up in video games and TV shows and even appearing in a summer blockbuster film that I'm so excited about I may just scream. Oh and he's got a new ongoing comic all to himself too. It's written and drawn by Skottie Young, who is a bit of a genius with the pens and brushes. I first encountered his work during Marvel's somewhat wobbly Mangaverse event back in the dim and distant early days of the 21st Century and I've followed him on and off ever since. His art is bold and full of character and movement -- what I would call -- "cartoony" in my more naïve reviewing days -- and is a perfect fit for a bouncy, kinetic character like Rocket. Young's lines are more loose and scratchy here than in some of his previous work and I'm reminded a little of Doug Tennapel's Earthworm Jim; that's no bad thing. I would be happy enough with one of my favourite comic artists drawing one of my favourite comic characters but Young also does a good job with the writing. This isn't dense or ground-breaking science fiction like Brandon Graham's Prophet but it is fast and funny; the characters have distinctive personalities -- as may be expected, Rocket himself comes over as the most defined -- and Young manages to sketch out a broad setting and set the main plot in motion all in the first issue. 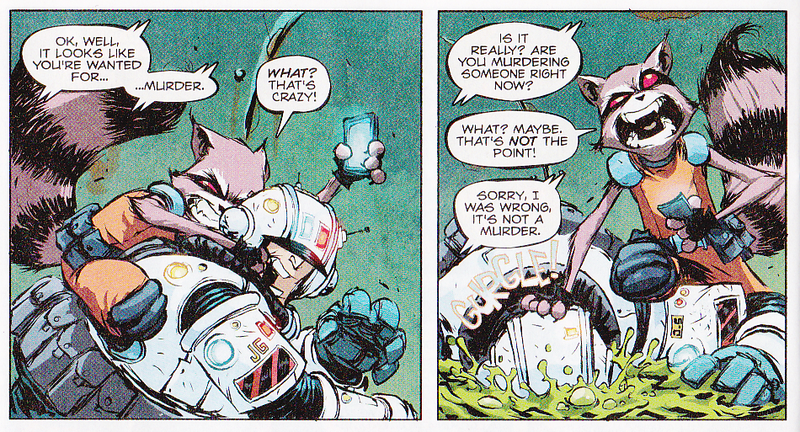 As a result it's light and breezy but I'm not expecting anything else from the character; the Rocket Raccoon and Groot mini series from a couple of years ago slapped on multiple layers of angst and tried to make the character Very Serious™ and it all seemed a bit misjudged. Young's approach seems much more true to Rocket's swashbuckling origins. 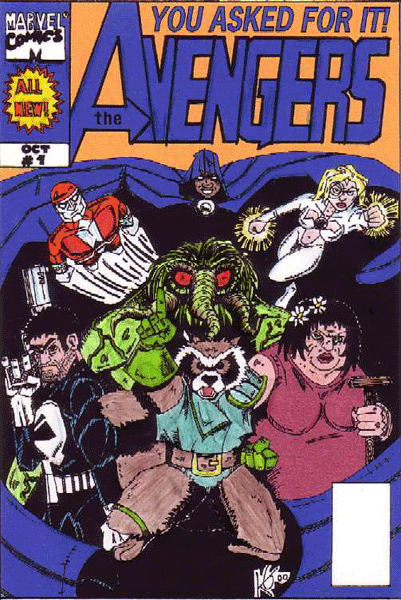 I don't know if Bill Mantlo is getting anything from this series. I doubt it as he doesn't even get a "Special thanks" credit, let alone a "Created by" and that's a bit crappy because even if he did create the character for Marvel he still created the character. So if you buy and enjoy Rocket Raccoon #1 then please consider a donation to Mantlo's continued medical care because without him the comic wouldn't exist. Thank you.